Potatoes, I love you. Honestly, potatoes should be in their own special food group. And pie. That’s another food group. Now you can have two in one with this tart—not just for an appetizer (that’s the point at this time of year)—but also for an easy lunch when you want something special. You could make it in any shape (round, square or rectangle) that suits your fancy. Topped with melted Parmesan, golden potatoes and rosemary, this tart is your ticket to an easy, sensational appetizer for any holiday party. Frozen puff pastry dough (look for all-butter pastry) is your secret weapon; the sheets come in various sizes, so make adjustments as needed, and don’t worry about perfection. Cut it into two long rectangles so you can slice it into small squares, larger rectangles or wedges, each with a bite of the crisp dough. The tart can be made several hours ahead and reheated in a 350-degree oven for 5 to 7 minutes.You say potato, I say potahto—don’t call the whole thing off!! Just make and enjoy. The holidays shouldn’t have to be hard. 1. Set the oven at 400 degrees. Line a baking sheet with parchment paper. 3. Sprinkle each rectangle with 1 tablespoon of the rosemary and ⅓ cup of the Parmesan. 4. Using a mandoline or thin, sharp knife, cut the potatoes into 1/8-inch thick (or thinner) slices. Spread them evenly over the pastry. Brush with oil. Sprinkle with salt and pepper. 5. Bake for 30 to 35 minutes, checking after 20 minutes to see if the pastry has puffed unevenly. If so, deflate with the tip of a paring knife. When done, the potatoes should be browned and tender when pierced with a skewer and the pastry golden at the edges. 6. 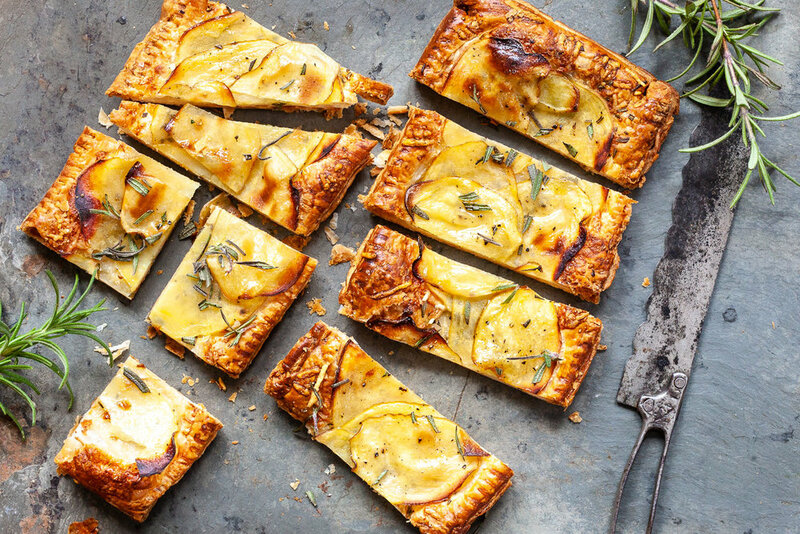 Slide the tarts onto a cutting board and sprinkle with the remaining rosemary. Slice into rectangles, wedges or small squares. Serve warm.